A group of mathematicians is taking a new look at some old problems and using crafts like knitting and crocheting to solve them. A stop sign can be folded into a pair of pants. Coral reefs can be crocheted. The atmosphere itself can be knit. Welcome to the intersection of math and handicraft. Unexpectedly, handicraft in general, and yarn work in particular, has started to help provide answers to a wide range of mathematical problems. From the way the atmosphere generates weather to the shape of the human brain, knit and crocheted models have provided new insight into the geometry of the natural world. “Crochet, knitting and other crafts allow people to visualize, recontextualize and develop new problems and answers,” said Carolyn Yackel, an assistant math professor at Mercer University in Atlanta. The math of handicraft was long dismissed as merely a cute trick or an inconsequential coincidence. Now, however, handicraft has begun to come into its own as a legitimate tool for mathematical research. This is especially true of knitting and crochet, which, thanks to the efforts of a new group of researchers, are now receiving a great deal of attention from the world of theoretical mathematics. Yackel and Osinga, along with Sarah-Marie Belcastro of Smith College and Daina Taimina of Cornell University, form the core of the group looking at the intersection of math and craft. Some of them are using craft to help answer math problems, while others are using math to answer knitting problems. In 2005, there was a special session on math and the fiber arts during a joint meeting of the American Mathematical Society and the Mathematical Association of America. This conference, along with a newly released book based on the special session by its organizers, represents the newest expressions of a very old topic. It is believed that the partnership between math and craft dates back to the invention of geometry, where the repetitive patterns seen in ancient baskets and weavings first hinted at a mathematical subtext to the world at large. Later, Alan Turing, the theorist and computer scientist, was often seen knitting Möbeus strips and other geometric shapes during his lunch break. The modern interest in math and craft began in 1997 when Taimina devised a plan for crocheting a hyperbolic plane. Hyperbolic planes are spaces of negative curvature (imagine the shape of a riding saddle) where all lines curve away from each other. Hyperbolic planes are fairly common in nature, appearing everywhere from the frills on a sea slug to growth patterns of coral to the way the brain folds. The craft objects themselves tend to be common shapes, such as discs, spheres and cones. However, just as a triangle that normally only has 180 degrees worth of angles can have three 90-degree angles when drawn on a sphere, the shapes take on novel and surprising forms when projected across hyperbolic space. Despite being widespread in nature and well understood in theoretical math, no good physical models of a hyperbolic shape existed until Taimina crocheted her first plane. In hyperbolic space, points move away from each other as the shape expands. While it is hard to model this using paper or plastic, it is easily replicated by simply increasing the number of stitches per row as the shape is knit or crocheted. “What you can do is get a tactile insight. I theoretically understand the concept, but [the model] allows me to communicate it,” said Taimina. After Taimina’s crocheted models gained a degree of notoriety, Hinke Osinga realized that if a hyperbolic plane could be modeled with crochet, then a model of the complex shape her research focused on could be made the same way. Osinga was looking at the Lorenz manifold, another shape that had yet to be presented in a physical model. Manifolds are shapes where the curved nature of the larger shape can be treated as a flat plane over short distances, like a two dimensional road map sufficiently representing a portion of the three dimensional Earth. The Lorenz manifold models how objects move through a chaotic space such as a flowing river or the atmosphere. Various applications include meteorological prediction and spacecraft navigation. Before Osinga made her crochet Lorenz manifold, there had never been a physical model of this shape for reference. Around the same time that Osinga was using craft to answer questions about math, Caroline Yackel and Sarah-Marie Belcastro began their attempt to answer questions raised by craft with math. Belcastro designed a mathematic proof detailing why any topological surface can be knit. While seemingly limited to explaining yarn work, the proof could have ramifications for biology. A range of phenomena from shell growth to bird’s nest-building replicate knitting by building up a structure one line at a time. For Yackel, the research involved moving beyond knitting. Instead, she began using Japanese string balls called tamari as the basis for designing a way to map out points on a sphere. Tamari balls are decorative items made from colored strings wrapped around a small wooden or plastic sphere. As the strings crisscross the surface of the sphere, they form intricate patterns. To approximate points on the sphere, tamari artists use origami techniques that are actually just physical representations of very complex geometry. Together, Yackel and Belcastro have co-edited a new book called Making Mathematics with Needlework: Ten Papers and Ten Projects. In it, they use the knitting of a baby’s pants to show how, in certain types of mathematics, an octagon can be folded into a two-holed donut. Using their math, if one crocheted a stop sign, it could be folded into a pair of pants. For all of the researchers involved in this field, pursuing the link between everyday objects and complex math hearkens back to the original impetus for devising geometry in the first place. Is it art or science? A microscopic image of our ancestor’s thigh bone blurs the definitions. VIDEO: Art on the brain. Artists interpret the latest neuroscience research. I’m a knitter/crocheter and this item makes me swoon with happiness at the connections being made possible through the mighty needle. It is so, so, so just the right medium to help make the complex simple and the chaotic ordered. All those who learn to knit and/or crochet have access to feeling all these things and often are at peace while doing so … thereby allowing the brain to work its magic and think the wondrously new and resolve the knottiest problems. So good to see concrete evidence of the power of the needle! I’m a geek and a knitter. This is really cool. I’m totally impressed. 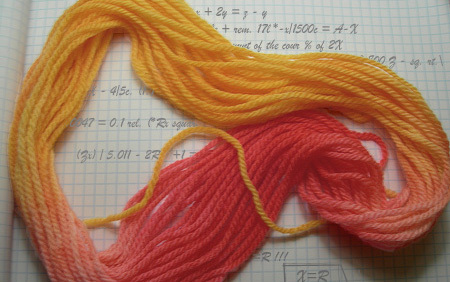 Knitting has an awful lot to do with maths. Nice to know it can explain complex theories. I like using maths to design my own knitting patterns, and believe knitting is useful in education for teaching mathematical concepts and for training the two sides of the brain to work together by using both hands. You can knit visible demonstrations of fractals, prime numbers – all sorts of things. I have always been fascinated with geometry and trigonometry both of which are very helpful in design work. I have been planning for many years to make a quilt using Penrose tiles. These fat and skinny diamond shapes allow one to uniformly cover a flat surface using a five-sided figure. I will definitely be looking for that patterns spoken about in this article. What was one of the mathematical problems that they solved? What was the solution? I would love to see pictures of the items created and also one pattern for some mathmatical item. I have been knitting ever since my grandmother taught me over 50 years ago, and am fascinated by this. I have been browsing on-line more tnan 3 hours today, but I never discovered any fascinsting article like yours.